The HDCP11AB is designed to deal with the recent development of products that feature the non-backwards compatible HDCP 2.2 format. The HDCP11AB converts the HDCP 2.2 input to a lower HDCP format allowing integration of HDCP 2.2 source products to non-HDCP 2.2 compatible equipment (displays, AV receivers, soundbars etc). 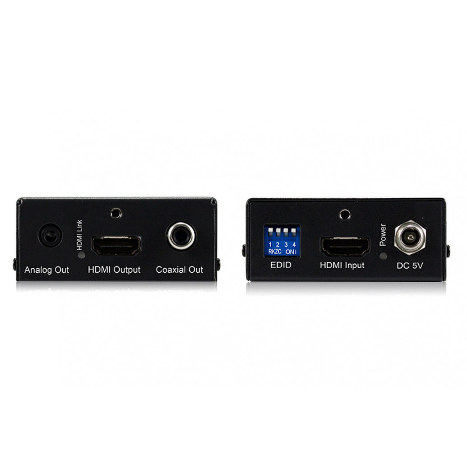 The HDCP11 also features in-built EDID management and has HDMI de-embedding to extract audio from the HDMI input onto both analogue and Coaxial digital outputs concurrently. This solution prevents the need to upgrade all of your HDMI video components when a HDCP 2.2 source is added to the system.